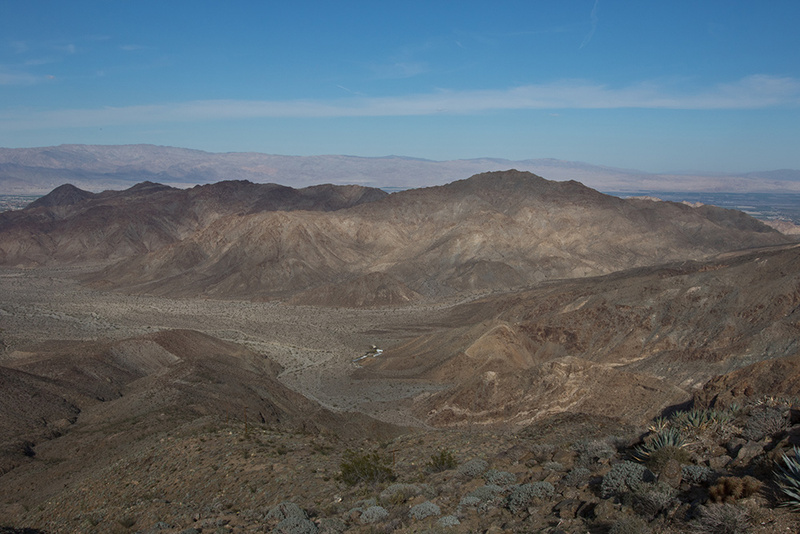 The Philip L. Boyd Deep Canyon Desert Research Center (Deep Canyon) is a 2,477 ha (6,122 ac) reserve located on the western edge of the Colorado Desert in the Coachella Valley about 115 km east of Riverside, California. Deep Canyon is located on the northeastern flank of the Santa Rosa Mountains near the western edge of the Colorado Desert. The Deep Canyon Research Area consists of 2,477 ha (6122 ac) of UC owned land without public access, and 4372 ha (10,800 ac) of adjacent federal land with nonexclusive Research Use Agreements. The Research Area includes Deep Canyon, a major north-trending gorge that drains over 100 km2 (39 mi2) of the Santa Rosa Mountain watershed, a 2,438 m (7999 ft) descent over a 16 km (10 mi) distance. Lower Sonoran and Upper Sonoran life zones link the flora and fauna of the Colorado Desert with the Peninsular Mountain Ranges. These mountain ranges create the rain shadow effect that makes the Colorado Desert one of the driest regions in North America. The climate is characterized by hot summers, scant and erratic rainfall, and strong vernal winds. At Boyd Center (290 m) July is the hottest month with average daily high and low temperatures of 39.6 and 26.1 °C. The 43-year average annual rainfall is 142 mm with extremes of 27 mm (2002) and 478 mm (1983). Under the prevailing conditions of heat and aridity, the Deep Canyon region supports a rich flora and fauna typical of the Colorado Desert and the Peninsular Mountains. Within the Deep Canyon watershed there are 696 species of vascular plants and 334 species of vertebrates. This biotically diverse setting encourages research, which constitutes about 70% of Deep Canyon’s use. Within commuting distance of Boyd Center there are a variety of other research opportunities in varied ecosystems that include aeolian sand habitats in the Coachella Valley Preserve System, Mojave Desert in Joshua Tree National Park; and chaparral, pinyon-juniper, and Jeffrey pine forest in the San Bernardino National Forest and the Santa Rosa and San Jacinto National Monument. Deep Canyon is the only protected site in the Colorado Desert dedicated to research and teaching. There is no public access or recreational use of Deep Canyon. Scientists may undertake long-term projects with confidence that their sites will not be disturbed by conflicting uses. Additional protection is conferred by encompassing state and federal administrative overlays that limit activities on adjacent lands. The entire research area is within a no-hunting State Game Refuge and the Santa Rosa and San Jacinto National Monument.